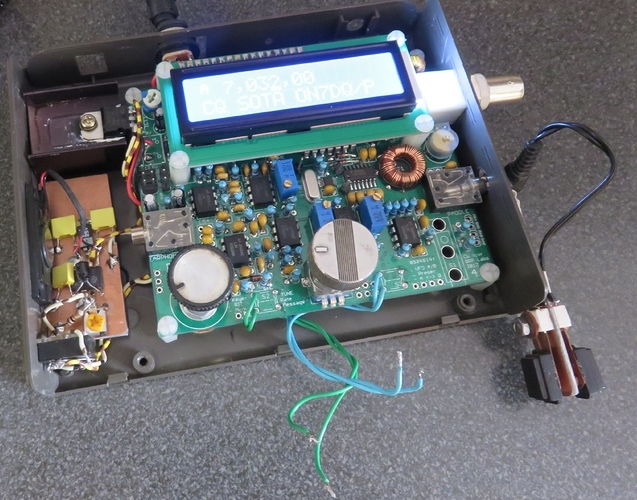 Been busy modding the QRP Labs QCX transceiver and like to share it, so someone might get some inspirtation from it. 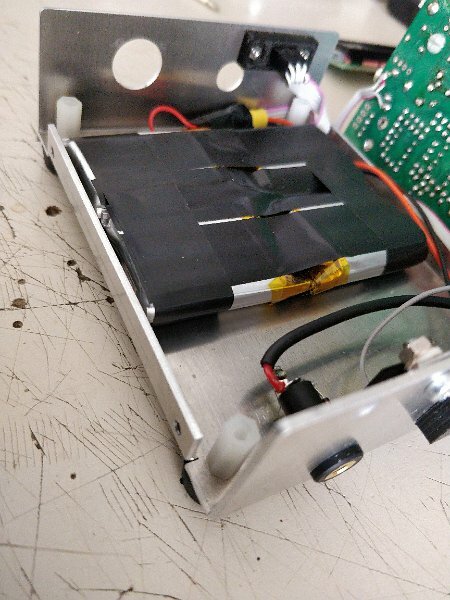 I joint 4 Li-ion cells to a 4S battery with nominal voltage of 14.8 Volt (cell type 103040, 30x40x10mm, 1200mAh, 3.7V) it fits inside the housing underneath the PCB. i put a thin sheet of insulating foam between battery and PCB keeping the batterypack firmly in place. At the GPS connector location a made a 6Pin connector with one pin blocked so i can’t put the charging connecter in wrong, now i can balance charge the individual li-ion cells. I replaced the power connector with a 3.5mm stereo audiojack for the headphones. 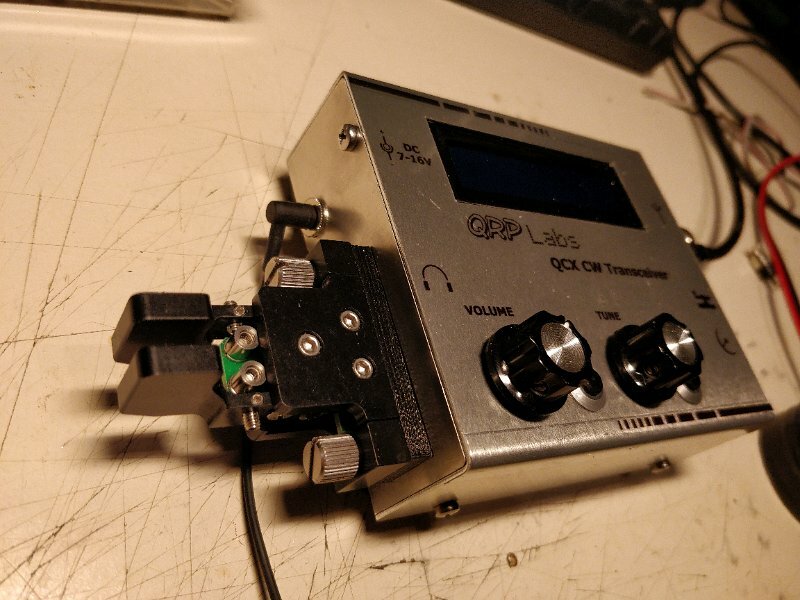 I mounted a P-channel FET witch switches the power supply on/off by plugging in/out the headphones. The transceiver is now standalone and with 1 meter coax and a end-fed antenna using a FT82-43 transformer with 10 meter wire i now have a 5Watt 20mtr portable CW station weighing under 600 grams. As for battery life, it seems oke, but needs further testing. I really like what you’ve done here. However, the manual states that the risk of blowing the PA rises significantly once over 15v. Are you sure a 4s LiPo battery is a good idea? I would be more inclined to 3s in order to play it safe. 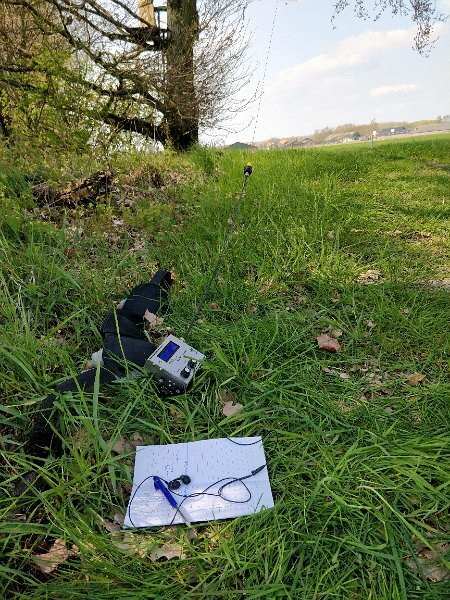 TinySWR je jednoduchý indikátor SWR a RF pro QRP vysílače na velmi malém plošném spoji navrž . Any space left over can be put to good use in other ways. 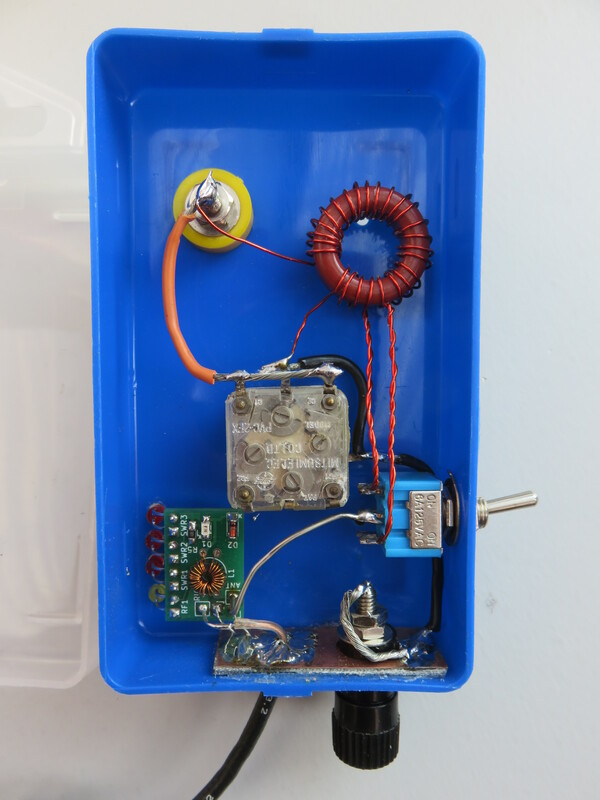 I have built my second QCX (40m model) in a D-Link AP box. Also using a 4-cell pack without problems so far, considering that a 4-cell pack doesn’t stay at 16.8V very long, and I didn’t bridge the “idiot” diode. But I did put the 7805 on a large heatsink, it gets quite hot otherwise. And I glued an IC heatsink to the three BS170’s with superglue. In the picture : the 4 cell Li-Ion battery fits in an audio cassette case. Using an external speaker at the time. “Clothespeg” paddle (the history of that paddle is here ). The antenna on the kitchen table is a portable “Patterson” loop, which got me RBN spots all over EU. In the extra space I later added a small LF amplifier board and flat speaker (from a laptop). 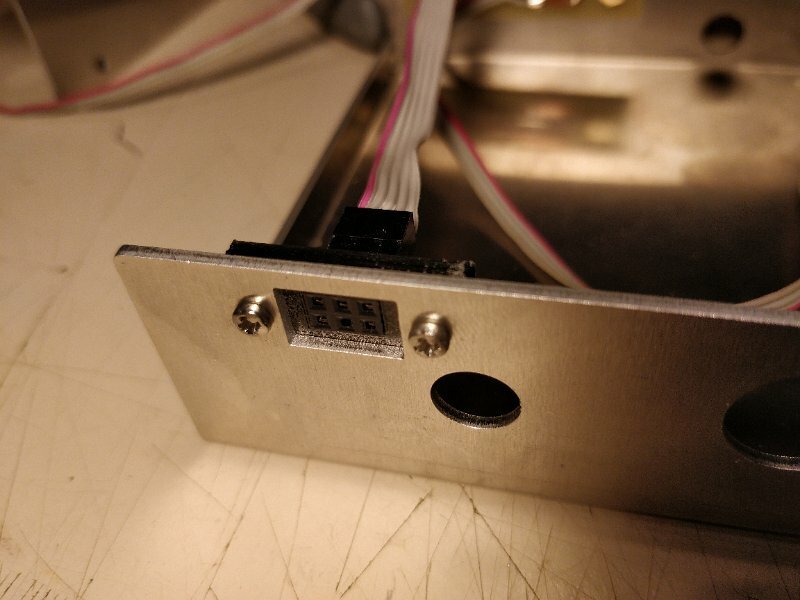 Here a look inside (the pushbuttons are mounted on the lid). 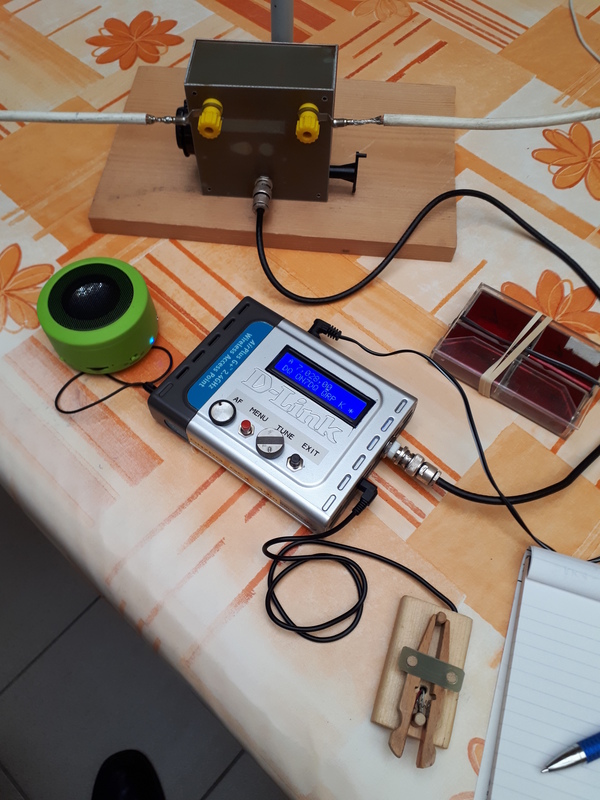 I used a Tiny SWR board in an external Endfed tuner (Fuchs type), so that I can use it with several different rigs (the TinySWR is bottom left in the picture). More pics and details on request.